Scissor Lifts, Lift Tables, and Turntable Lifts are ideal for proper positioning of materials for better work productivity. They can greatly improve workplace safety and minimize ergonomic injuries. We sell and service all major brands. Scissor Lifts, also called lift tables, are the preferred ergonomic solution for material work positioning and vertical lifting. They are designed to improve worker productivity while reducing the potential for workplace injuries. Turntable Lifts are lift tables that add the convenience of rotating your work rather than having to walk around the table. 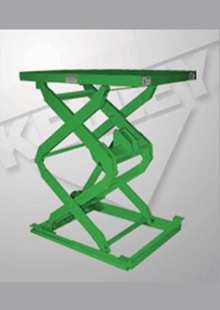 Call a McKinley vertical lift expert to discuss your in-plant scissor lift or repair service needs.